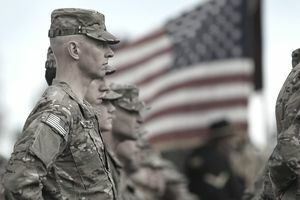 The Army offers re-enlistment bonuses for soldiers who hold certain military occupational specialties and/or special skills, who agree to re-enlist for active duty. Whether or not a bonus is offered and the amount of money involved depends on several factors, including MOS/skill, rank, how much active duty time the soldier has, and for how long the soldier is re-enlisting. Re-enlistment bonuses are subject to federal income tax, except when the soldier re-enlists in a designated combat zone. In that case, the entire amount of the re-enlistment bonus is tax-free. Whether or not a re-enlistment bonus is subject to state income tax depends on the laws of the individual state, that the soldier claims as his or her legal residence. These are slightly different than retention bonuses, which is when an officer or enlisted soldier serving in a designated "critical area" agrees to extend active duty for at least a year. This kind of bonus is not generally available to soldiers who have more than 25 years of active duty or are approaching their 25th year. If a soldier has completed at least 17 months but less than 14 years of active duty and is qualified in a skill the Department of Defense identifies as critical, he or she is likely eligible for re-enlistment and a corresponding bonus. The amount of bonuses and the skills most in need will vary. Usually, in order to be eligible to receive a bonus, soldiers will reenlist or voluntarily extend their enlistment for at least three years. Besides re-enlistment bonuses, the Army offers other types of financial incentives for both new recruits and enlisted soldiers. A seasonal bonus of up to $20,000 is available for recruits who ship to basic combat training within a specific time frame. Soldiers who successfully complete officer candidate school (OCS) training and commissioning may be eligible for a $10,000 bonus, which they receive upon completion of OCS. Soldiers who complete Ranger indoctrination and get permanently stationed in the 75th Ranger regiment, which is a special ops unit, may receive a bonus of up to $10,000 once they've reported for duty. Another type of bonus that the Army and other branches of the U.S. military offer, on a regular basis, is for those soldiers who enlist as a MOS 35M human intelligence (HUMINT) collector. Soldiers in this MOS conduct source operations, interrogations and debriefings to collect information. They are primarily responsible for supervising and conducting information collection operations. Among their duties include preparation of information intelligence reports, which may include difficult translations, conducting debriefings and interrogations of HUMINT sources in English and foreign languages. These soldiers are in demand if they speak one of the priority languages for which the Army needs translators. That list can vary but includes Arabic Modern Standard, Arabic Egyptian, Arabic Libyan, Arabic Lebanese, Arabic Moroccan, Arabic Tunisian, Arabic Iraqi, Chinese Mandarin, French, Korean, Persian-Farsi, Persian-Dari, and Russian. Bonuses for soldiers who speak at least one of these languages can be as much as $40,000.